Several groups of Christians associated with Leeds Church Institute have been going round in circles recently, and we enjoy it so much, we’re going to do it some more. Our Wild City Retreats have, for two years now, been circling round the seasons, within the boundaries and the teeming life of the City. We offered quiet spaces for those looking for new or deeper forms of spirituality through listening to the earth alongside the city. Meanwhile Reflect: Harehills has taken walks round and round one small part of the city, with prayer and theological reflection on the way. We have thought about the fruits of this kind of perambulation, as we return to the place we started from and find somethings have changed. Building on these experiences, we are taking on a new reflective challenge, to explore how the City connects with the Country. Change often sneaks up on us, unawares. Take Saint Francis for example: I’m sure you remember how he preached to the birds. Quaintly amusing story. How were the birds changed? We don’t know the answer to that, but the experience for Francis himself was transformative. Once he’d recovered from the shock of deeply sensing their responsiveness to God, he started to question himself and rebuked himself for failure to take these creatures seriously,. The most important part of this story is not that he preached to birds, but the impact that preaching to birds had on him. He realised an integration of his calling as a preacher with his love of the natural world, and gained a new outlook and identity in his ministry. I’m not a preacher, but with St Francis, I find that the physicality of walking can be an instigator of insight and change. As a therapist, working with refugees in Harehills, I would often walk home through Potternewton Park or Gledhow Valley Woods. It was a refreshing way to process some of the unimaginable trauma I had been listening to through the day, and quite often, once I let this go, insights would come when least expected, as I watched the seasons turn in these small green spaces of the city. In this instance, I think I would call this prayer situated on a route where natural space is very close to one of the most densely populated areas of inner city in Europe. “Walking prayer” could be one definition of Pilgrimage. A pilgrim takes time out to visit holy places, seek enlightenment, show solidarity with others, often sharing food with them: the word “companion” means one with whom you share bread. This time last year, many were involved with “The People’s Pilgrimage” walking for theological and practical action around climate change. (See Stroma McDermott’s article in this magazine “L is for Lifestyle, P is for Pilgrim” for more about pilgrimage) Many people were changed through this process, though political shifts leave much to be desired. How can we turn the hearts of our politicians, serve the suffering in our city, and seek change ourselves? One answer is in this elusive practice of prayer. LCI has been part of many initiatives which help us to pray for the welfare of our city. Now, we are proposing an exciting new project to walk the boundaries of our city, the Leeds Country Way, in sections over a year, circling the city in prayer. That other Francis, the current Pope, has written a powerful short book: ‘“Laudate Si”- Praise Be – ‘on care for our common home’, which was spoken about memorably at LCI by the politician/theologian, John Battle. John will be joining us on this pilgrimage, providing reflections to help us connect pilgrimage to issues of justice and environment. As a starting point, Laudate Si will provide provocative stimulation. And as “companions” we’ll be seeking out pubs and cafes to share more than just bread on the way. “But a pilgrimage is to a sacred site” objected a friend recently, “which sacred sites will this one go to?” I don’t want to devalue the fact that certain places are clearly sacred in a very meaningful way. Perhaps we will discover that our “feet are on holy ground” in most unlikely places. Perhaps there will be traditional places of pilgrimage found on the way. Or just perhaps, the circling of the city in this way is a declaration that the whole city itself is a place of sacred worth. You’ll have to join us to find out some answers to these questions, and no doubt unexpected surprises as well. And if you aren’t able to join us, for whatever reason, there will be plenty of ways to follow the story, on LCI’s website. So don’t let’s go round in circles. The spiritual journey has been perceived as a spiral. We often return to what feels like the same place. Wisdom allows us to understand that it’s not just a circle, but a spiral, of ever deepening integration in our busy lives. 21st September, 19th October and 23rd November. One Response to Are we just going round in circles? 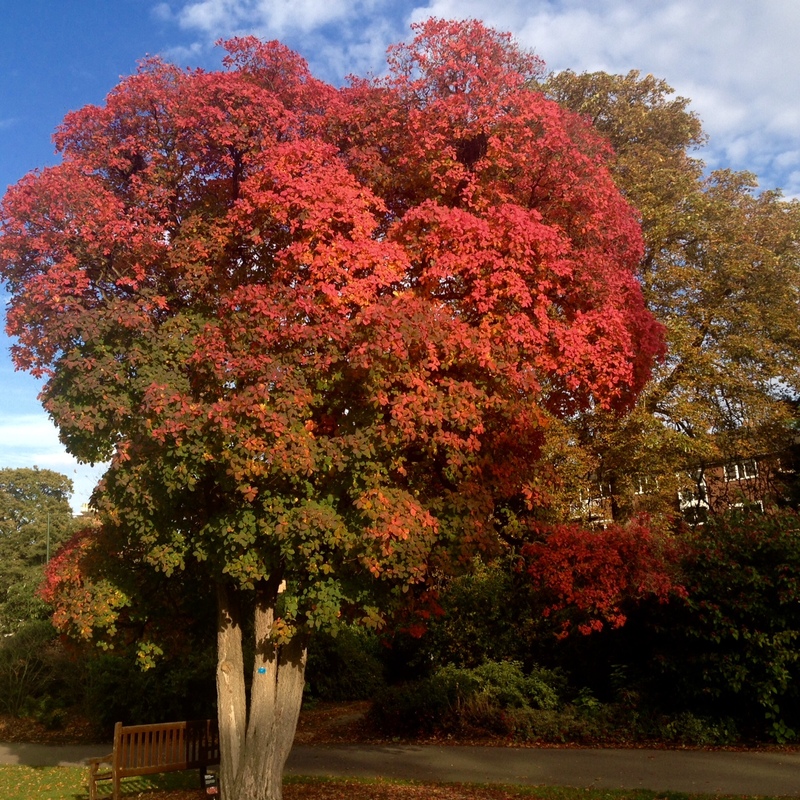 Can anyone recognise this glorious Autumn tree? Clue: I’m sorry, it’s NOT Leeds!